Melissa's family makes this recipe for Christmas morning and other special occasions. You can make the dough the night before and place it in the refrigerator overnight. The next morning, take the dough out, roll it up with the cinnamon and sugar, and let it rise for the last time. 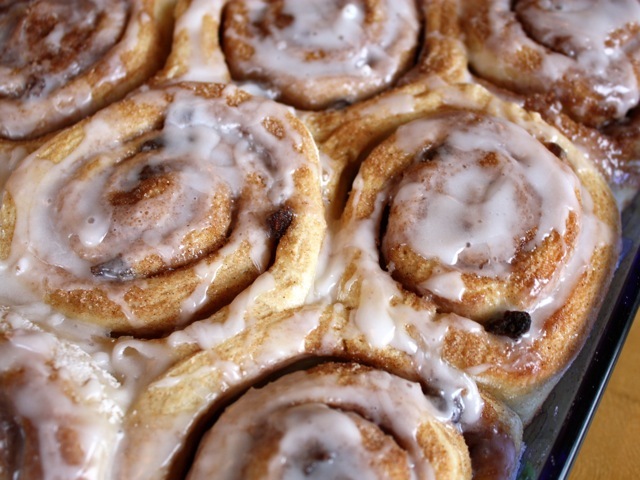 In no time you'll have fresh, hot cinnamon rolls for breakfast. Place 2 cups of the milk in a saucepan over medium heat and bring just to a boil. Combine 6 tablespoons of the sugar, the salt, and the butter in a large bowl. Pour the hot milk over it and let cool to 110 to 115 degrees. In a small bowl, mix together the egg and yeast. Add to the cooled milk mixture and mix well. Add the flour and mix until the dough is soft. Transfer the dough to a well-floured board and knead until very smooth and elastic, about 5 minutes. Place the dough in a large, well-greased bowl, cover with plastic wrap, and let rise until doubled in volume, about 1 hour (or overnight in the refrigerator). Grease a 9-by-13-inch pan and set it aside. Punch the dough down, place it on a well-floured board, and roll it out into a 10-by-14-inch rectangle. Brush it with the melted butter. Combine the cinnamon and the remaining 1 cup sugar and sprinkle the mixture over the butter. Starting at one of the long sides, roll the dough up and pinch the seam well to seal. Using a serrated knife, cut the dough into 2-inch-thick slices and place them in the prepared pan. Cover with plastic wrap and let rise one more time, until doubled in volume, about 1 hour. When the rolls have risen, bake until golden-brown, about 25 minutes. Let cool for about 5 minutes. While the rolls are cooling, combine the powdered sugar and the remaining 3 tablespoons milk to make a glaze. Drizzle the glaze over the cinnamon rolls and serve warm. Pecan Sticky Buns These are so rich that you'll want to serve them as the focal point of a simple breakfast or brunch. All you'll need to add is some fresh fruit and really good yogurt. Follow the Cinnamon Rolls master recipe. Just before slicing the dough into rolls, melt 1 cup unsalted butter in a saucepan over medium-high heat, add 3 1/2 cups brown sugar, and whisk until well blended. Add 1 cup light corn syrup and boil, whisking constantly, until the brown sugar has dissolved, about 1 minute. Pour the mixture into the prepared pan, and sprinkle with 2 cups chopped pecans. Cut the dough into 1-inch-thick slices, and place in the pan. Bake as directed in the master recipe. After the baked rolls have cooled for 5 minutes, carefully flip the pan over onto a sheet pan to release the rolls. Let cool for 5 minutes longer before serving. Omit the glaze. Serve warm. Dried Fruit Cinnamon Rolls Port-soaked dried fruit adds texture and distinctive flavor to an otherwise simple breakfast bread. Combine 3/4 cup dried sour cherries and 3/4 cup dried cranberries with 2 cups ruby port in a saucepan over medium heat. Bring to a boil and cook until the fruit has absorbed almost all of the liquid, 5 to 6 minutes. Let cool completely, and then chop coarsely; set aside. Follow the Cinnamon Rolls master recipe. After rolling the dough into a rectangle and sprinkling it with the cinnamon sugar, scatter the prepared fruit over the dough, and then top the fruit with 1 cup chopped toasted walnuts. Proceed as directed in the master recipe. Serve warm. Culinate editor's notes: This recipe makes a dozen rolls, not 18. For a less bland-tasting dough, use 4 cups white flour and 2 cups whole-wheat pastry flour. Cut the cinnamon and sugar in half, otherwise the rolls will be both too sweet and too messy (the excess cinnamon-sugar mixture falls out of the rolls during prep). Use brown sugar instead of white sugar mixed with the cinnamon for a more molassesy, gooey taste. If you like raisins in your rolls, sprinkle 1/2 to 1 cup raisins atop the butter-cinnamon-sugar layer before rolling up the rolls. You'll probably need to bake the rolls at least 30 minutes, not 25. Finally, cut the powdered sugar in half for the glaze. Use the full 3 Tablespoons milk for a runnier glaze, or 1 1/2 Tablespoons for a thicker glaze.